An Approach to Teaching 1984 – You Do Hoodoo? Having just finished teaching Orwell’s 1984 for the first time in twenty years, I thought I’d share my approach with anyone out there interested in tackling the novel. I find covering novels during a school year very challenging because of the time involved, and limited reading assignments make coming up with lessons difficult because students don’t know the complete arc of the narrative. In this case, my victims are high-achieving 9th graders. What struck me when rereading the novel is its high artistic achievement. 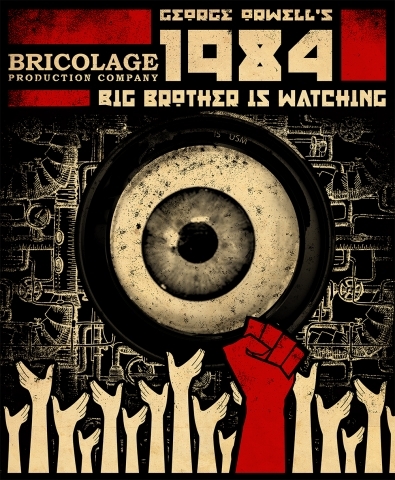 For whatever reason, I remembered it as being more polemical than artistic; however, I now consider 1984 as a beautifully synthesized work in which setting, character, plot, symbolism all reinforce one another to create a devastatingly powerful whole. But where in the hell to begin? There’s so much there: the geographic dynamics of the three superstates, the concept of doublethink, the linguistics of Newspeak, the pervasiveness of totalitarianism, the structure of the novel — not to mention characterization and symbolism. I begin with characterization, with Winston, the protagonist. The first reading assignment is short, the first seven pages of the Signet Classic edition, the assignment ending when Winston writes the date April 4, 1984 in his diary. In our close reading, we focus on Winston’s fragility, how his overalls symbolically swallow him, much as his dystopian world has swallowed him. We discuss the setting and especially the tone. O’Brien was a large, burly man with a thick neck and a course, humorous, brutal face. In spite of his formidable appearance, he had a certain charm of manner [. . .]. Winston had seen O’Brien perhaps a dozen times in almost as many years. He felt deeply drawn to him, and not solely because he was intrigued by the contrast between O’Brien’s urbane manner and his prizefighter’s physique. Note that prevalence of negativity in that ambiguous description and how O’Brien’s very appearance calls to mind doublethink, the paradoxical juxtapositioning of antithetical elements. WAR IS PEACE. O’BRIEN’S UGLY MUG IS ATTRACTIVE. During Winston’s interrogation near the end of the book, we return to this passage. Obviously, Winston “misread” O’Brien. In the passages describing “the flicks” and the Two Minutes of Hate, we explore how the violence involved in the movies and the “two minutes” might negatively condition even intelligent contrarians like Winston, which sets up later revelations like his regret over not killing his wife when he had the opportunity or his blithely promising to throw sulfuric acid into the face of a child. Of course, contemporary phenomena like violent video games offer correlations students can relate to. Sections 3 and 4 provide elaboration and an opportunity to discuss the modus operandi of the State, the barbarism of the children, the undermining of basic human instincts like filial love. We also discuss the ubiquitous surveillance of Outer Party members and how telescreens and hidden microphones create paranoia and why a paranoid populace would be less inclined to rebel. In Sections 4 and 5, we tackle Newspeak. I encourage students to record Newspeak vocabulary in their notebooks, and on our once-a-week block day (85 minutes as opposed to 45), I have them translate the first sentence of A Tale of Two Cities into Newspeak. What a wonderful opportunity to discuss language and how the specificity of vocabulary sharpens perception. We talk about the role that language plays in shaping what we call reality. I ask them to visualize an oleander. If they don’t know the word, I tell them an oleander is a bush. Then I compare descriptions between a student who knows what an oleander is and a student who describes a bush. (Or you could have one student sketch an oleander and another a bush). We discuss how eliminating words and simplifying vocabulary help to restrict thought in Oceania. Section 8, the last section of Part One, is particularly important as Winston enters the prole ghetto, visits a pub, and discusses the past with a senile old man. We debate the pros and cons of being a prole versus a party member. Here also is a chance to question the relationship between human cognition and our understanding of history. At the end of Part 1, I show the movie trailer for the 1984 version starring John Hurt. They could not alter your feelings; for that matter you couldn’t alter them yourself, even if you wanted to. They could not lay bare in the utmost detail everything you had done or said or thought; but the inner heart, whose workings were mysterious even to yourself, remained impregnable. Obviously, a comparison and contrast between Winston and Julia is a potential subject for discussion or a paper. Although I’m a frequent quizzer, I don’t quiz them on the contents of “The Theory and Practice of Oligarchical Collectivism,” the treatise written by Inner Party Members but attributed to the fictitious Emmanuel Goldstein. This part of novel is not nearly as popular with the students and difficult for many of them to comprehend. We do discuss the geopolitical configuration of the planet, but spend most of our time exploring how the ubiquitous slogans (IGNORANCE IS STRENGTH, etc.) work as paradoxes that can contain some elements of truth. It is vitally important to the Inner Party that the people of Oceania be kept in a perpetual state of paranoia. Discuss how this is achieved and, most importantly, why it is so important to the party’s system of control. Discuss the use of technology to control public and private behavior in 1984. How does Newspeak enable the Party to control thought and limit emotion? How important is Newspeak in the plan for perpetual Party power? Would you rather be a prole or a Party member in 1984? Why or why not? Provide examples from the novel to support your argument. I allow students to choose whatever topic interests them the most, and at least this year, the groups broke down remarkably well into units of three and four. These topics end up being the basis of a writing assignment, which I’ll reproduce at the end of the post. In Part 3, I introduce students to the three elements Aristotle’s rhetoric: ethos, logos, and pathos and argue that O’Brien’s interrogation is an act of persuasion that utilizes these three elements. Here, I’m indebted to Emele Brax’s dissertation “A Rhetorical Reading of George Orwell’s 1984,” which you can find here. We discuss how O’Brien establishes his credibility and Winston’s ambiguous feelings toward him (ethos), how O’Brien manipulates logic to convince Winston that Winston is wrong (logos), and how appeals to pathos, i.e., comfort, protection, and family help to convert Winston into a believer. We also talk about O’Brien’s contention that reality only exists in the minds of right-thinking Party members. I introduce them to the concept of existentialism. Of course, the students disagree, so I take on O’Brien’s persona, hold four fingers up and ask how many they see, explain to them they’ve been brainwashed by Western humanism. I ask them to imagine that they’re North Koreans and how might their interpretations differ if that were the case. This play acting leads to a summing up discussion, so all that’s left is the paper. Your first sentence should mention the title and author and convey that 1984 is an important dystopian work about totalitarianism. The next three or four sentences should provide a short summary of the culture of Oceania. Then depending on your topic, you should pivot towards your thesis. For example, for topic number 1, you might say something to the effect that because of constant surveillance and the tendency for neighbors and children to inform on their parents and friends, paranoia runs rampant among Party members. For number 2, you might say something to the effect that being under constant surveillance controls both public and private behavior, which makes rebellion next to impossible. For number 3, you’d mention Newspeak as a major factor in limiting Party members ability to reason and experience emotions before stating your thesis. For number 4, your pivot should mention the distribution of the prole and Party population and how they’re treated by the Inner Party before stating your thesis. Each body paragraph’s topic sentence should reflect an idea in your thesis and should be debatable (in other words not a statement of fact). You need to demonstrate that the topic sentences are true by providing examples from the novel via direct quotations. When incorporating quotes, provide context (where and when the quote appears, and if it comes from a character, tell us who says it). Fluidly incorporate quotes into your own prose. You don’t want long quotes but to break quotes into small segments and “sandwich” them into your analytical sentences. End your paper with a conclusion that doesn’t merely summarize your argument but pivots to another related aspect of the novel. For example, if you argue that being a Party Member is better than being a prole, you might end the paper by discussing what a terrible choice it is because Party members lead wretched lives given that . . .
 4 April was coincidentally the day the reading assignment was due. Both O’Brien and Big Brother are father figures. This entry was posted in education, free lesson plan and tagged 1984, Newspeak, Orwell, teaching, telescreens. Bookmark the permalink. Hey, I like the lesson plan post! My 3rd trimester is PBL with philosophy class (Plato’s Republic), Spanish Literature (Asturia’s El Senor Presidente), Estudio Sociales (Guatemalan constitution), and English (Huxley’s Brave New World). Students have to combine one theme and three sub-themes from each of their classes and create a game or booth that might be found at a Guatemalan fair (Feria Chapina) in the future. Next year, I want to use 1984 as well. Thanks and happy getting-close-to-the-end-of the-year to you! Hey, Russell. It’s so challenging teaching something for the first time. Sounds as if y’all got a great, challenging program down there. Please, if you’re ever up this way, get in touch. Pingback: Why Donald Trump Is an Orwellian Nightmare for English Teachers – You Do Hoodoo? Sheesh, Wesley! You hit the jackpot for the creativity gene. Thanks, Rodney! By the way, Merry Christmas. Are the four questions discussed on Block Day, the actual essay prompts to which the students wrote? Yes, Matthew. They write on the prompt they discussed. Thanks for reading. Pingback: 1984 Revisited — Doubleplusscary – You Do Hoodoo?